Twinklet was saved by the DBARC team from certain death, back in July 2016. Her story is one that has touched thousands and she’s had thousands of words written about her, including in Dogs Today Magazine. A year on from her first Schnauzerfest where she was unable to walk, although she enjoyed being out celebrating her life with the many friends she has made, we are sharing here what the past year has meant to Twinklet, from her mum Donna, a DBARC volunteer. To those who dumped her in July 2016, Twinklet was nothing more than a discarded breeding machine. They cared little about dumping her with horrendous and life-threatening injuries. But someone did care thankfully and went to her rescue. She was still in a critical condition when DBARC took her into care, following initial emergency vet treatment. With pus streaming from numerous wounds on her tiny frail body, with a badly fractured jaw, dangerously dehydrated, and shying away in terror from those who sought to help her, the DBARC Vets gave a very guarded prognosis. But Twinklet had not given up on life, and we all at DBARC knew we could not give up on her. Thankfully, our dependable friends in the Schnauzerfest team were right there when we called. They mobilised as only they know how and provided much more than moral support, immediately launching “Twinklet’s Smile Appeal” to help with what would clearly be extensive and expensive medical needs for this innocent little victim of human greed and neglect. Twinklet had probably never known any love or kindness in her earlier life, but now things would change for this brave little soul. While our DBARC Vets worked on repairing her injuries, and we worked on her general care and happiness, we were so thankful for all the other help coming our way. Supporters of the appeal didn’t just send funds to help Twinklet, loving messages of hope flooded in, along with gifts to improve her welfare. It was so rewarding to see Twinklet herself slowly but steadily improving. Her confidence grew, and her cheeky character began to emerge! What a transformation, and how wonderful that the fantastic generosity of Schnauzerfest supporters helped this sweet little angel to win her battle back from the brink. That tiny body with improbably large ears contains a tenacious and determined character, as well as a loyal and loving heart. 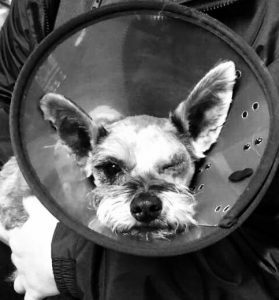 But Twinklet needed help to fight her battle, and thankfully Schnauzerfesters were there to give it. In spades. In fact, she’s still receiving so much for which we are so very thankful. Earlier this year she had sight restored to one eye with cataract surgery, massively improving her confidence, and is due to have her other eye repaired soon. 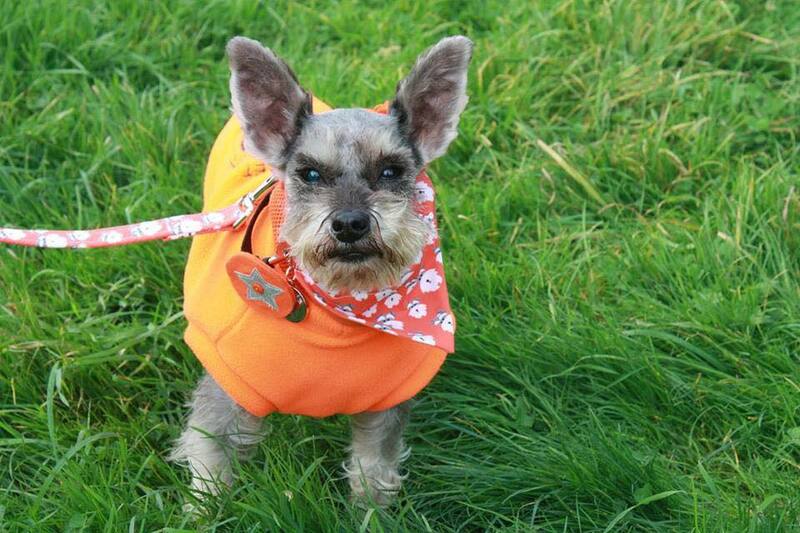 When you donate to Schnauzerfest, host or help with the events, help behind the scenes, buy the fundraising items, when you talk to passers-by who are looking in amazement at a mass of happy Schnauzers with a distinctive orange theme, when you tell people what Schnauzerfest is all about, you are making it possible for other dogs like Twinklet to get the care they need. They’re the innocent little souls who suffer due to greed and ignorance, but your generosity and your support can transform their lives, and bring them from the dark world they have endured into the sunshine of lives of love and happiness. We have no doubt at all that Twinklet will be out enjoying Schnauzerfest 2019 and being the terrific example of how to get on and enjoy life, whatever it throws at us! You can read a whole archive of Twinklet’s journey and how DBARC and Schnauzerfest have transformed her life on this link.